On November 16th, in Qingyang, Gansu (甘肃庆阳), a minivan with a rated capacity of 9 people but carrying 63 daycare children collided with a truck, killing 19 children and 2 adults. We offer a group of photos culled from Weibo to illustrate the incident. 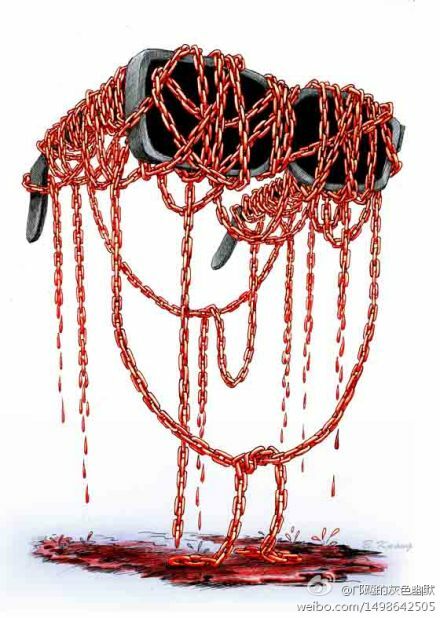 We also continue to follow the two cases, Chen Guangcheng’s and Ai Weiwei’s, that lay bare China’s “rule of law”, while offer other items for your thoughts. Click on an item for a link to the original. Sadness and outcries poured in on Weibo, while CCTV’s Evening News made no mention of it. 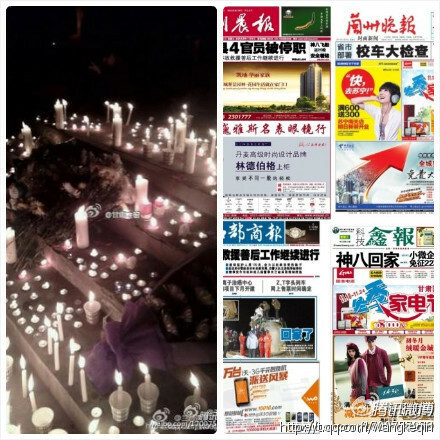 The photo below on the left shows candles lit by residents in Dongfanghong Square (东方红广场) in Lanzhou (兰州), the provincial capital city, and on the right is a shot of the front pages of four papers in the same city the following day. yizhuducao一株毒草 / A poisonous weed/yi zhu du cao/(netizen)/: Ai Weiwei: I am doing so [referring to his legal challege against the “taxes” and “fines” levied on him by the government] to let the entire society and the government know that no one can use law as a means of retaliation to destroy a man who thinks differently. They can’t use their dirty tricks to suppress a free-expressing artist. If a nation uses fake law to shut people up, it has no future. Both aesthetically and morally, you [referring to “they”] have already lost. You may win a battle because you have power, but you will lose the war. 于建嵘/Yu Jianrong/(Professor at the Rural Development Institute, Chinese Academy of Social Sciences)/I just gave a lecture [to a group of officials] in Tsinghua University. An official from Jiangsu told me that everyone understands that China’s current problems must be solved by establishing fairness and justice, democracy, and the rule of law. The problem is, leadership on all levels wouldn’t dare. When asked why, he said, “Interests. Political and economic interests. No one in power now really wants to sacrifice their own interests for the future of the country and the people, because, absent of democracy, they can enjoy a monopoly on power; absent of the rule of law, they can pillage by violence. yancaiwm三俗猫/Three-Vulgar Cat/san su mao/(netizen)/: Hu Xing Dou [胡星斗, economist]: Three numbers that shake China-60% of millionaires are either in the process of, or are preparing for, immigration abroad; 40% of billionaires want to immigrate to the US; and 90% of the descendants of the rich-and-powerful are already living in the US. 王冉/Wang Ran/(investment banker in Beijing)/: Traffic in the intersection underneath the bridge once again turned into a pot of congee. Sometimes I find this amusing: With the intelligence and the mind of today’s Chinese, are we incapable of passing through an intersection that has definitive traffic lights in an orderly manner? By T in Uncategorized on November 19, 2011 . I can hardly bear to think about that minivan stuffed with children. Now I understand how a similar van was stuffed with kindergarten children last summer and one got left inside by accident and died of heatstroke. At the time I could not fathom how the adult had not checked all the kids off the bus. I never dreamt that so many little children would be stuffed inside one small vehicle. And how could the parents allow their precious babies be transported to school in this manner? I hope this dreadful accident brings about some changes in society. Sadly, this is one of dozens of school “bus” related accidents that have happened so far this year. Basically, it happens because of financial limitations. Parent’s can’t afford to pay for better transportation than these ridiculously dangerous vans, and usually the schools have little role in arranging it. These accidents are also the result of schools being located in major villages, so that most children do not have any other way but by car. It would seem that if the gov’t is not going to provide a local school, they should supply a vehicle to safely transport the children. Some of the chilldren are “left behind” children whose parents are migrant workers away from home to make a living. Such “school bus” arrangements exist mostly in the countryside, and as is the case with the entire rural population in China, the children and their parents are just left to their own devices with little, if any, support/subsidy from the government. Thank you for explaining it to me. These “left behind” children, if they survive the risks of their childhood, will possibly grow up hugely damaged by the lack of parental involvement in their rearing. It’s another problem that China will have to face in the future, when adults with emotional difficulties are out in the big wide world looking for fulfilment. Some of my 80 hou friends complain of a “disconnect” with their parents. I find it very troubling. In the meantime, People’s Daily argued that schools couldn’t afford buses because they cost “over 100,000RMB” yet, they just announced that gov’t officials shouldn’t spend more than 180,000RMB on a car. It seems that in a country where the gov’t spends over 6 billion RMB on vehicles, somebody could find room in the budget to get kids to school. According to “China Statistics Yearbook’ [didn’t specify which year], China has 19,522 townships. If each town is provided with two school buses each of which costing 400,000 yuan, that’s 15.6 billion yuan. So it is not a matter whether the government has money or not. It does! No need for citizens to donate, and all the government has to do is to take out 15.6 billion yuan from its 300 billion yuan vehicle consumption.